Atmospheric modelling has a long tradition in climatology, stretching back to Hadley and his basic representation of the earth's wind and pressure belts. That classic model of the atmospheric circulation, along with the many variants which were subsequently developed, was a representative model. It showed the characteristic distribution of wind and pressure across the earth's surface in a simplified form, with no attempt to predict change in the system. Change was first dealt with at the local or regional level when attempts were made to forecast future weather conditions, and it is to weather forecasting that most modern predictive models can trace their origins. The earliest weather forecasts depended very much on the interpretation of atmospheric conditions by an experienced observer who used his accumulated knowledge of past events to predict future short-term changes in weather conditions. Particular skills in that field were often attributed to sailors, farmers and others who were regularly exposed to the vagaries of the weather in their work. This subjective approach continued well into modern times, but by the end of World War I the first of the modern predictive models was being developed. This was the mid-latitude frontal model which grew out of the work of the Norwegian school of meteorology. With its combination of air masses, anticyclones and frontal depressions it was the mainstay of weather forecasting in mid-latitudes for half a century. Past experience with such systems coupled with observations of their on-going development allowed local weather conditions to be predicted twelve to twenty-four hours ahead. As knowledge of the working of the atmosphere grew in the 1940s and 1950s, it became clear that such models over-simplified the complex dynamics of the atmospheric system, and new methods of prediction were sought. In these new models, atmospheric physical processes were represented by a series of fundamental equations. Three of the equations were derived from the laws of conservation of momentum, mass and energy, which dealt with motion in the atmosphere. In addition, the models included an equation of state derived from the gas laws of classical physics—which related atmospheric pressure, density and temperature— plus a moisture equation (Washington and Parkinson 1986). When solved repeatedly for a series of small but incremental changes, at selected grid points across the study area, these equations provided a forecast of the future state of the atmosphere. L.F.Richardson, a British meteorologist, was a pioneer in this field, publishing the results of his work in 1922 in his book, Weather Prediction by Numerical Process (Ashford 1981). At that time his methods were not practicable. The complexity of the computations, and the existence of only rudimentary methods of mechanical calculation meant that the predictions could not keep ahead of changing weather conditions. As a result no real forecast could be made. The inadequacies of existing upper-air observations also contributed to the failure of this first attempt at numerical forecasting (Ashford 1992). Following this initial setback, little was done to develop numerical prediction further until the 1950s and 1960s when advances in computer technology and improved methods of observation led to the development of models capable of predicting changes in the essential meteorological elements across the globe. Since then these methods have been widely adopted, and numerical modelling is currently the most common method of weather forecasting for periods of several hours to 5 or 6 days ahead. 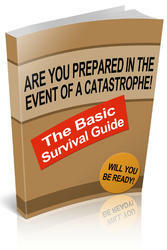 Problems remain, however, despite the growing sophistication of the systems used. Gaps exist in the data required to run the models, for example. Ocean coverage is thin and the number of observing stations in high latitudes is small. Problems of scale may also arise depending upon the horizontal and vertical resolution of the model. A coarse resolution, for example, will miss the development of small scale phenomena such as the shower cells associated with local convective activity. A fine resolution model will provide greater accuracy, but only at a cost. Even the simplest weather models require a billion mathematical operations before they can produce a single day's forecast (Levenson 1989). In setting up the grid reference points used in the calculations, therefore, a compromise has to be struck between the accuracy required and the cost of running the program. The UK Meteorological Office, for example has developed two variants of its forecasting model. The global version has a horizontal grid with a resolution of 1.5° latitude by 1.875° longitude, and includes fifteen levels stretching from the surface into the stratosphere. In contrast, a finer grid with a resolution of 0.75° latitude and 0.9375° longitude is only available for an area covering the North Atlantic and Western Europe (Barry and Chorley 1992). Atmospheric models designed to simulate climate change also depend upon numerical prediction, but they differ in a number of important ways from the weather forecasting models. For example, over the short time periods (4-5 days) covered by the weather forecasting models, environmental elements such as vegetation, oceans, ice sheets and glaciers can be considered as static or unchanging, and therefore contributing little to atmospheric change. Over the longer time scales (10-50 years) involved in in the climate models, however, these elements would be expected to change, and that change must be incorporated in the models. This may be simple if the change remains linear, but difficulties arise when response to change initiates feedback in the earth/atmosphere system. Many of the uncertainties in the results of climate modelling can be traced to the inability of the models to deal adequately with climate feedback mechanisms. The spatial resolution of climate models also tends to be coarser than that of weather models. Modern computer systems are remarkably sophisticated, but their use is at times constrained by such factors as operational speed, memory capacity and cost. For example, the additional calculations introduced to accommodate the longer time scale and greater number of environmental variables incorporated in the climate models increases the computer memory and time required. This in turn increases the cost of running the model. A reduction in the number of grid points at which the calculations are made helps to keep these elements at manageable levels, but it also produces a coarser resolution in the model. Typical climate models have a resolution which is three to six times coarser than that of weather forecasting models. Although this still allows adequate representation of macro-scale climate features, it gives only limited results at the regional level (Cubasch and Cess 1990). In an attempt to improve regional or meso-scale resolution, Australian scientists have developed a method in which a meso-scale model is 'nested' or 'embedded' within a macro-scale global climate model. This nested model, driven by the global model which surrounds it, is programmed to provide much finer detail at the regional level than is possible with the standard model alone. Since the extra information is required for only a limited area, and the running of the global model is unaffected, both the additional computer time needed and the costs remain manageable. Tests suggest that this is the best method currently available for achieving increased spatial resolution, although it requires further development before it can be used for climate prediction (Henderson-Sellers 1991). Several important climatic processes take place at regional scales, and are therefore missed by the macro-scale grids of most climate models. However, since they affect the predictions produced by the models, they must be included. This is done through a process of parameterization, in which statistical relationships are established between the small scale processes and the grid scale variables. Since the latter can be calculated by the models, the values of the small scale processes can then be estimated (Hengeveld 1991). 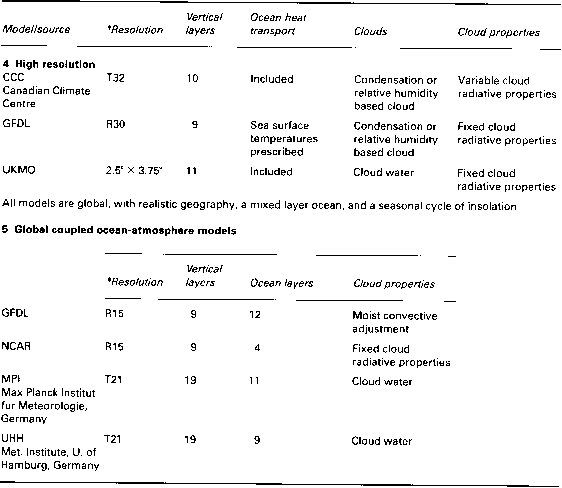 For example, existing models cannot deal with individual clouds, but average cloudiness in a particular grid-box can be predicted using temperature and humidity values calculated by the model (Schneider 1987). Other variables that require parameterization include radiation, evaporation and land surface processes. Climate models take various forms, and involve various levels of complexity, depending upon the application for which they are designed. A simple model, for example, may provide only one value, such as the average temperature of the earth. Increasing levels of sophistication produce one- and two-dimensional models and the complex three-dimensional general circulation models, which depend upon the full use of numerical prediction to produce results. One dimensional (1-D) models provide information on change along a vertical line stretching from the earth's surface up into the atmosphere. The main inputs into these models are incoming solar radiation and returning terrestrial radiation, and they can be used to estimate such elements as temperature changes initiated by changing atmospheric aerosol levels. They treat the earth as a uniform surface with no geography and no seasons. As a result they are inadequate to deal with the uneven surface energy distribution associated with the differences in heat capacity between land and ocean. One dimensional models have been used frequently to estimate the impact of volcanic eruptions on climate, and a 1-D radiative convective model was used to establish the TTAPS scenario of nuclear winter (Turco et al. 1983). At best, 1-D models are useful for the preliminary investigation of global scale radiative and convective processes at different levels in the atmosphere. However, they cannot deal with seasonal or regional scale features, and require so many assumptions that their ability to provide accurate predictions is limited. Two-dimensional (2-D) models add a meridional or latitudinal component to the altitudinal component of the 1-D models. They can consider variations in climate along a vertical cross-section from pole to pole, for example, or along a specific line of latitude. This allows the horizontal redistribution of such elements as energy or particulate matter to be examined. Two-dimensional models can therefore include consideration of differences in heat capacity between land and ocean, but their ability to deal with the evolving dynamics of the atmosphere once change has been initiated remains limited. Like the 1-D models, they contributed to the early development of the concept of nuclear winter, but they were quickly superseded by more sophisticated three-dimensional models. Three-dimensional (3-D) models provide full spatial analysis of the atmosphere. They incorporate major atmospheric processes plus local climate features predicted through the process of parameterization. The simulations of current and future climates provided by these models require powerful computers capable of processing as many as 200,000 equations at tens of thousands of points in a three-dimensional grid covering the earth's surface, and reaching through two to fifteen levels as high as 30 km into the atmosphere (Hengeveld 1991). In addition to these grid-point models, spectral models have been developed. In these, the emphasis is on the representation of atmospheric disturbances or waves by a finite number of mathematical functions. Many of the more advanced models incorporate this approach (Cubasch and Cess 1990). Climate models of this type are known as general circulation models (GCMs). They can be programmed to recognize the role of land and sea in the development of global climates. Their complex representation of atmospheric processes allows the inclusion of the important feedback mechanisms missing from 1-D and 2-D models, and they can deal with the progressive change set in motion when one or more of the components of the atmosphere is altered. With typical integration times for GCMs ranging from several decades to 100 years, this ability to deal with the evolving dynamics of the atmosphere is important. take centuries or even millenia to respond (Washington and Parkinson 1986). As a result, running a completely interactive coupled atmosphere-ocean model, until all elements reach equilibrium, is time-consuming and costly. Because of this, the oceanic element in most coupled models is much less comprehensive than the atmospheric element. The ocean is commonly modelled as a slab which represents only the uppermost layer of water in which the temperature is relatively uniform with depth. Oceanic heat storage is calculated only for the chosen depth of the layer, and other elements such as oceanic heat transport and exchanges with the deeper parts of the ocean are neglected or calculated indirectly (Cubasch and Cess 1990). Thus, although the coupling of the atmospheric and oceanic circulations should improve the accuracy of the modelling process, since it more closely emulates the real environment, the results are often no better than those obtained from the individual uncoupled models (Washington and Parkinson 1986). ^Resolution is defined either by latitude and longitude (e.g. 4°x5°) in grid point models, or by the number of waves (moving disturbances) that can be accommodated in spectral models (e.g. R15 or T32). 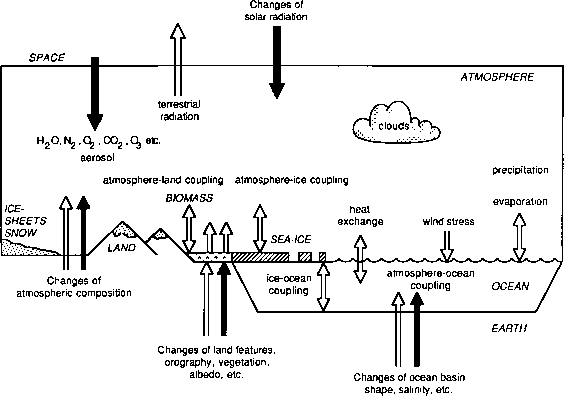 particularly important in studies of global warming, have already been coupled to ocean models, and chemical models are being developed to investigate the influence of other trace gases on the general circulation of the atmosphere (Cubasch and Cess 1990). Global circulation models are being developed or refined at about a dozen universities, government laboratories and research institutes around the world (see Table 2.4). Most of the effort has gone into producing equilibrium models. In these change is introduced into a model which represents existing climate conditions, and the model is then allowed to run until a new equilibrium is reached. The new model climate can then be compared with the original to establish the overall impact of the change, The numerous GCMs used to study the impact of a doubling of atmospheric carbon dioxide on world climates are of this type. They make no attempt to estimate changing conditions during the transient phase of the model run, although these conditions may well have important environmental impacts long before equilibrium is reached. The development of transient or time-dependent models which would provide the interim information currently lags behind that of the equilibrium models. The few existing transient models are of coarse resolution, but yield results which are broadly consistent with those from the more common equilibrium models (Bretherton et al. 1990). They incorporate a coupled ocean-atmosphere system with full ocean dynamics, and require increased computer power and improved ocean observation data, before they can make a greater contribution to the study of future climate change. Despite the increasing complexity of current GCMs, the fact remains that like all models they represent a compromise between the complexities of the earth/atmosphere system and the constraints imposed by such factors as data availability, computer size and speed and the cost of model development and operation, which limit the accuracy of the final result. The quality of specific simulations can be tested by comparing model predictions with the results obtained by direct measurement or observation. This approach shows, for example, that GCMs can simulate short-term changes such as seasonal cycles remarkably well (Schneider 1987), and their portrayal of atmospheric responses to sea surface temperature anomalies is usually considered as satisfactory. Simulations of Holocene climates, which provide an indication of the long-term capabilities of the models, have given results supported by palaeo-environmental indicators, such as fossil pollen distribution and former lake levels, revealed in lake and ocean sediment cores (Gates et al. 1990). These tests indicate that most simulations can represent the large scale characteristics of climate quite well, but significant errors remain at regional scales as a result of the coarse resolution common to most models. The accuracy of coupled models is also restricted by inadequate data on which to base the oceanic component. More powerful computers and improved parameterization will take care of some of these problems, but the general consensus is that the gap between climate simulation and reality will remain for some time to come. Changes in such elements as the composition of the atmosphere, global circulation patterns and the earth's energy budget are now widely recognized as components of most current global environmental issues. The relationships involved are complex, and remain imperfectly understood despite major advances in the acquisition and analysis of atmospheric data. Global climate models have been developed to investigate the processes further, and provide forecasts of future developments. These investigations and forecasts will allow a more effective response to the changes with the ultimate aim of minimizing their environmental impact.